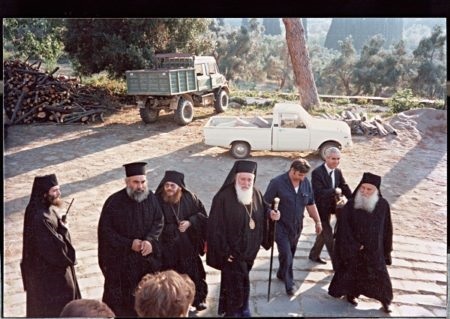 By God’s Grace, 30 years have now passed since the Holy and Great Monastery of Vatopaidi returned to the coenobitic way of life. For many of Pemptousia’s readers, this anniversary will not be of any particular significance. And rightly so. Anniversaries usually affect us when we have some experience which links us to the event in question. We were fortunate enough to visit Vatopaidi in 1987, as pupils of the Athoniada Ecclesiastical Academy. As became apparent many years later, this blessing was all the greater because, a mere few months earlier, the brotherhood of Elder Iosif had settled in the monastery. We were received and welcomed by the hieromonks Efraim and Athanasios, who bore the title of Pro-Abbot, as was the custom in rule of idiorrythmic houses. These two priests from the brotherhood later became Abbot of the Monastery (Efraim), and Metropolitan of Limassol (Athanasios). Our next visit took place in 2007, that is twenty years later. The alterations that had been made were truly astonishing. We could write whole pages on the changes we noticed in 2007 as compared to 1987, but suffice it to say that a complete transformation had been effected. The once imposing but almost deserted and ruined building complex had been turned into a vibrant monastic hive of activity, full of vigour, exuding spiritual fragrance and a sense of completeness. 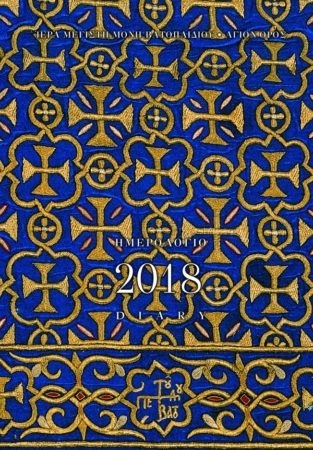 The diary for 2018, a splendid, elegant volume published and distributed by the Monastery, is therefore dedicated to the thirtieth anniversary of the return of Vatopaidi to the coenobitic life. The rich photographic material is accompanied by explanatory texts. Anyone leafing through the diary is transported to the climate of the Holy Mountain, where the presence of Our Most Holy Lady the Mother of God reigns and where, at any given moment, thousands of prayers are offered, ‘with inexpressible sighing’, for the salvation of the whole world. The diary is cloth-bound with an external cover, 17 by 24 cms., consisting of 176 pages and 143 photographs. Those interested in ordering a copy can do so through [email protected] . The letter from His All-Holiness Bartholomew, the Ecumenical Patriarch, and the ensuing prologue to the edition by Elder Efraim, the Abbot of the Monastery, accurately describe the transition of the Holy and Great Monastery of Vatopaidi from the rule of an idiorrythmic monastery to that of a coenobium. Even more importantly, however, attention is drawn to the fact that the change goes beyond matters of administration and bureaucracy. It has been marked by a complete spiritual overhaul and rebirth which began thirty years ago and is still continuing today. 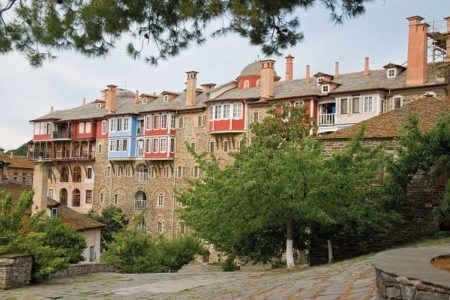 In both its printed and electronic form, Pemptousia was founded on the initiative of the Elder and brotherhood of the Monastery and continues to enjoy their material and spiritual support. Those of us who work on the publication would like to share this experience with you: Vatopaidi represents an uncommonly magnificent historical, cultural and, above all spiritual treasury of riches. 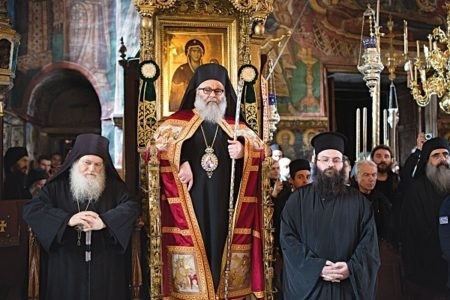 The Elder and the brotherhood have not sought to keep this wealth for themselves, but have found ways of making it known to the full complement of the Orthodox Church, not only in Greece but throughout the world. Pemptousia and its staff are grateful and honoured to have had the opportunity to be the prime vehicle in making these riches available. We would like to thank the Abbot and the Fathers of the Monastery for allowing us to share in their joy over the years, and we pray that God, through the prayers of His Holy Mother, who has pride of place in the Monastery, will strengthen them in their endeavours. 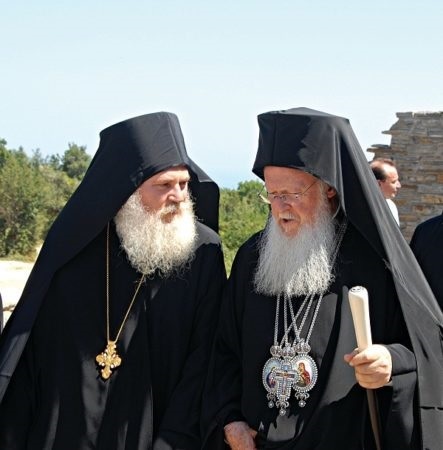 Right Reverend and Abbot, Archimandrite Efraim, and Fathers of the Holy, Royal, Patriarchal and Stavropegic Monastery of Vatopaidi on the Holy Mountain, children of Our Mediocrity, beloved in the Lord, grace and peace from the Lord be to your Reverence. It was with great joy that, on 17 October inst., we received a letter, ref. no. 1144/20.1.1, from your Reverence informing us of the forthcoming publication of the annual desk diary of the Holy Monastery of Vatopaidi for 2018, entitled ‘And from earth to heaven. 30 years in Vatopaidi’. 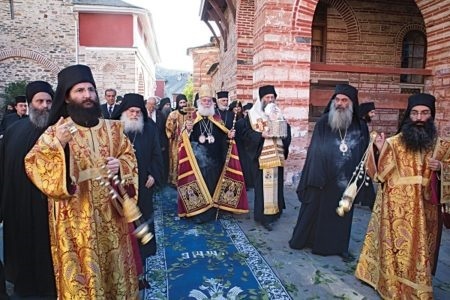 Indeed, thirty years have passed since your brotherhood moved into the Holy Patriarchal Monastery of Vatopaidi, and the Mother Church has not ceased to care for and support you in the long, uphill struggle of your ascetic life. 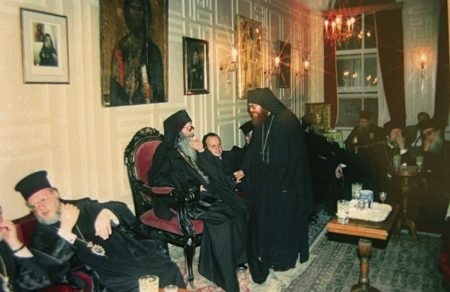 We remember clearly that, when your brotherhood applied to the Mother Church for the return of this renowned Monastery to the coenobitic state after five centuries of the idiorrythmic life-style, the Ecumenical Patriarchate issued a Venerable Patriarchal Sigillium, ref. no. 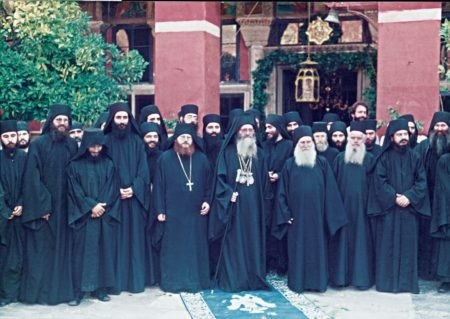 29/9-1-1990, allowing the transformation of the Holy Monastery of Vatopaidi into a Coenobium, and we are delighted to note the extent of the success of this return. 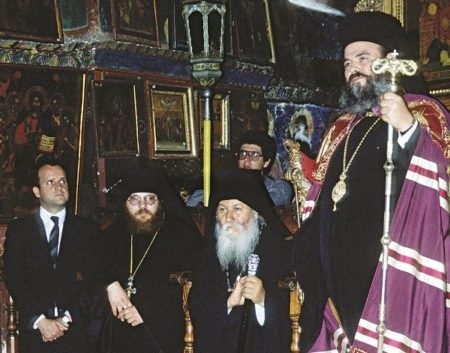 Since then, with no little satisfaction and paternal pride, we have supported your exertions in our prayers and have followed with a watchful eye the enormous effort and spirit of sacrifice, as well as the zeal, you have shown to restore the illustrious and historic Monastery of Vatopaidi to the spiritual pinnacle of the coenobitic order, as this was formulated by the heavenly luminary Basil the Great and the other God-bearing Fathers of the Monastic state. It is with joy that the Holy Mother Church of Christ has confirmed that your Holy Coenobium has remained strictly ‘unalloyed and cleansed of any idiorrythmic, private initiative or any other monastic abuse’. The fathers possess ‘everything in common: food, drink, sustenance, outer garments and clothing, footwear, money and so on. None has anything of his own, nor has the possibility of keeping something aside for himself, hidden within the monastery or outside, nor to say that he has anything of his own, even the least of things. Rather, they all eat together and think, act and speak in the same way, fulfilling the words of the Prophet “behold how good and how pleasant it is for brothers to dwell in the same place’”. The paternal pleasure of our Mediocrity, as shepherd and Bishop of the State of the Holy Mountain, extends to each of the brethren of the Monastery, who, with great diligence have attended to and persisted in that which was stated by the Mother Church and recorded in the Patriarchal Sigillium Letter on the Reversion to Coenobium. Here it declares that ‘we enjoin all to submit to the Abbot, and to obey and to exercise restraint, since restraint is the erasure of sins, the alienation from the passions, the severance of the will, the mortification of the body. They are to heed his advice and exhortations and not oppose him in anything, nor gainsay him, but should live the common life, observing the rules of Coenobitic Monasteries scrupulously and commemorating our Patriarchal name as custom demands. They are to dwell in harmony and spiritual love, with a fraternal outlook in God, as if they were one soul in many bodies, and are to contribute willingly, gladly and assiduously, for the benefit of the Holy Coenobium, as if they were working not for men but for the Lord’. In the intervening years, you have, indeed, ensured, in a variety of ways, that the Holy Coenobium has been refurbished and that most of the monumental building complex has been restored, while the astonishing beauty and exquisiteness of the treasures in the Sacristy of the Monastery have been preserved, conserved, digitalized and categorized. 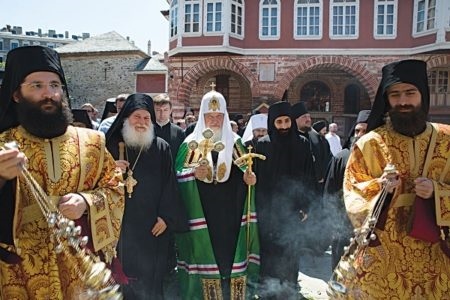 These have also been promoted through meticulously-prepared publications, which have highlighted the spiritual and ascetic riches of the Orthodox Tradition of our Eastern Church. In like manner, you have not abandoned the responsibility of preserving the essence of this renowned and historical House, as you are obliged to do, in accordance with the Divine and Sacred Canons and have endured with patience the many and varied trials to which you have been subjected, before finally being vindicated. We, too, hope with all our heart, that the outcome of the case will be wholly satisfactory and that the property rights of your Holy Monastery will be fully recognized. These are based on Sacred Chrysobulls regarding the famous Stavropegic Dependency of our Father among the Saints Nicholas the Wonder-Worker and its holdings. In all of this you have done well, and at the same time, moved only by charity, you have not neglected to provide for those who are suffering. Your struggle is, indeed, well-pleasing to God and proceeds directly ‘from earth to heaven’. Therefore, through this our Patriarchal Letter of Greeting, we congratulate you and send you our paternal and heart-felt blessing. We pray that the Lord God, through the intercessions of Our Most Holy Lady the Mother of God, the Patron of the Holy Monastery of your Repentance, will keep all of you and bring your monastic struggle to a felicitous conclusion and that He will bless your good works, for the glory and renown of our Great and Holy Mother Church of Christ and the edification of the people of God. Whose grace and infinite mercy be with all of you, beloved children in the Lord. 2017, November 10. The Holy Mountain is the only monastic centre in Orthodoxy which, through God’s providence, has survived for over a thousand years. It’s a place of ascetic labours and sanctity, unique architectural monuments and natural environment, as well as rare treasures which record our history. In the centuries which have passed, there have been periods of peace and creativity, but also of barbaric depredations. Thank God, however, this holy place has never been abandoned and its sacred traditions have been handed on from generation to generation, as has its multi-faceted culture, which has also come down to us. It’s well known that, from 1930 to 1970, there was a period of decline on the Holy Mountain, with very few monks, as a result of the various wars and ideological movements of the time. But, in those bleak times, God’s loving providence again supplied saintly Athonite fathers who, with their ascetic labours, their holy humility and other virtues became a light which shone and illumined the world. And so a host of young men, gazing upon their light, were attracted by it and, once they’d renounced the world, they chose the monastic life. Now, the Holy Mountain once again has a good number of monks, through the intercessions of Our Lady, the Mother of God, the Abbess of the Holy Mountain. One of these blessed figures was Elder Iosif the Hesychast (1897-1959), then inconspicuous but now famous in the Orthodox Church. 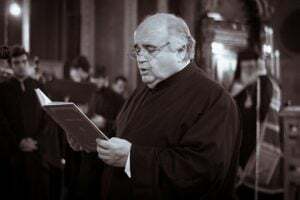 He was a man who lived to the full the Athonite Tradition, that is the acquisition of the virtues and the gifts of the Holy Spirit through repentance. The blessed Elder’s legacy to his disciples centred on the marriage between the hesychast and coenobitic ways of life. In other words, the practice of the Jesus Prayer and obedience. The Elder foresaw the future of his disciples and foretold that they would help to regenerate the Holy Mountain. 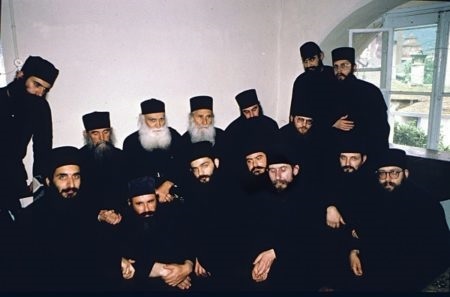 Indeed, in the decade of the 1960s, soon after his blessed demise, his spiritual children began to form their own brotherhoods: Elder Efraim, now in Arizona, who brought monks to the Holy Monasteries of Philotheou, Karakallou, Xiropotamou and Konstamonitou; Elder Haralambos, who did the same at the Holy Monastery of Dionysiou; Elder Efraim Katounakiotis, who gathered his brotherhood in the desert of Katounakia; and Elder Iosif, who re-staffed the Holy Monastery of Koutloumousiou and the Holy and Great Monastery of Vatopaidi. Elder Iosif was born in Cyprus in 1921. At the age of 15, in 1936, he entered the Holy Monastery of Stavrovouni, in order to become a monk. At that time, there were blessed Fathers at Stavrovouni, who had been weaned on the Holy Mountain and in its Sacred Tradition. After some nine years of the coenobitic monastic life in Cyprus, he left for the Holy Mountain, to seek a higher form of the spiritual life, at the side of the blessed Elder Iosif the Hesychast. He lived with the Elder for another twelve years, until the latter’s blessed demise. 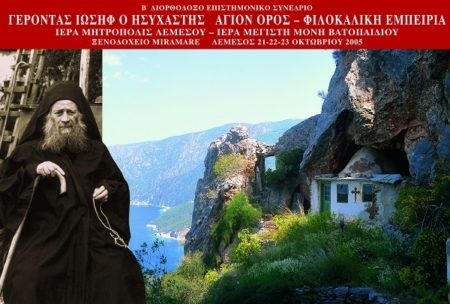 Thereafter, having regenerated the Holy Monastery of Koutloumousiou, he became Abbot of the Holy Monastery of the Precious Cross, in Minthi, Paphos, in Cyprus. 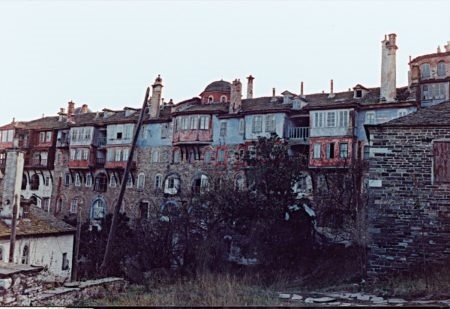 Once he’d attracted a brotherhood, he returned to the Holy Mountain and lived the ascetic life in New Skete from 1983 until 1987, when the few remaining, elderly, Fathers of Vatopaidi, as well as the Ecumenical Patriarchate and the Holy Community of the Holy Mountain, invited and approved the gradual settlement of the brotherhood in the Holy Monastery of Vatopaidi. A large part of the Greek civilization, as this was born and developed, initially in the Mediterranean, has been preserved on the Holy Mountain. This reached its height in the 4th century B.C. and was taken to the whole of the then known world by Alexander the Great. It was passed on to the Roman Empire and transformed into the Greek Christian civilization throughout the long period of the life of the Eastern Roman Empire, which lasted until the fall of Constantinople to the Ottomans in 1453. The fruits of this civilization, amassed in the great libraries of the Holy Mountain, such as that of Vatopaidi, were once again to make a huge contribution 300 years later, in 1749, when the Greek language and this wonderful civilization were in danger of extinction. 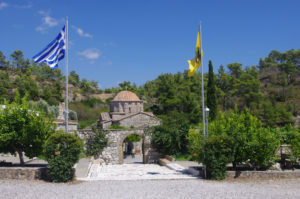 Among other developments of the time was the construction by the Holy Monastery of Vatopaidi of the Athoniada Academy, on the hill opposite the Monastery. 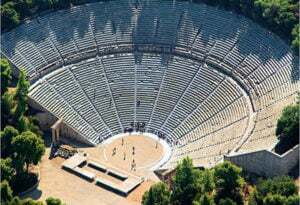 It bore the name ‘Academy’ to recall the Academy of Plato and its roots in Greek civilization, and in order to remind the Greeks of that period of their origins. Evidence of this continuum can be found in the arcade outside the church in the Monastery of Vatopaidi, and other Monasteries on the Holy Mountains where there are depictions of ancient Greek philosophers. From the Principals and students of the Athoniada, particularly Evyenios Voulgaris (1716-1806) and Saint Kosmas Aitolos (1714-1779), a wave of ideas was launched which was new for that period. In the end, this led to the realization, at least in part, of the dream of the Greek Revolution. Vatopaidi has also combined the sacred tradition of hesychasm and that of social mission, as is clear from the social missionary work of many of the Saints who lived here. Our Elder, Iosif, was aware of this sacred tradition and the great historical burden of the enterprise of regenerating the Holy Monastery when he initially refused to move there. In the end, it was only at the instigation of Elder Efraim Katounakiotis and Saint Païsios the Athonite that, with great faith, he accepted the heavy burden. In 1990, Vatopaidi became a coenobium. We owe a great debt of gratitude to the Fathers there, who, through their labours formed the connecting link between the idiorrhythmic and coenobitic ways of life and had looked after the Holy Monastery lovingly, to the best of their abilities. The brothers of the coenobium then took care of them until their repose. By the grace of God, the brotherhood quickly grew. A team of specialist scholars in all related fields began to consult and, together with the Fathers, to work in the Monastery, in order to restore the buildings and to preserve, catalogue and digitalize the treasures. This hidden spiritual wealth had to be saved, exhibited and promoted, and this was achieved through spiritual and other publications, transmission through the word of God, and academic conferences and seminars. With this in mind, in 1995, the Monastery launched the present series of diaries, which each year highlight and comment upon a spiritual, cultural or historical event. This year’s diary looks back on the works, efforts and events which have taken place in the thirty years which have passed since the brotherhood moved into the Holy Monastery. It’s God’s Grace which achieves everything. Christ said: ‘Without me you can do nothing’ (Jn. 15, 5). And Saint Paul adds that: ‘Everything works for the good for those who love God’ (Rom. 8, 28). The spiritual struggle of the brethren continues and expresses itself as a quest for the kingdom of heaven: ‘But strive first for the kingdom of God and His righteousness, and all these things will be given to you as well’ (Matth. 6, 33). We hope and pray that the brotherhood will continue to follow Sacred Tradition as they have received it from its spiritual begetters and Fathers. Our warmest thanks go to those who have contributed to the effort to preserve and promote this exceptional Orthodox spiritual and cultural treasury. We wish them all the blessing of Our Lady the Mother of God, the Abbess of the entire Holy Mountain and the particular Protectress of our Monastery and that, in the difficult times in which we live, we may be inspired to ‘fight the good fight’ and to tread the path of salvation unhindered.